Irish author/playwright Walter Macken’s 1963 children’s book Flight of the Doves, on its surface, may have seemed like a lightweight film project for director Ralph Nelson when, prodded by his then 12-year-old daughter Meredith, he bought the rights to it in 1969. He had done comedy before with Cary Grant in Father Goose, but by this point had completed two of the darkest films of his career beforehand – …tick…tick…tick… and Soldier Blue – and after making this film adaptation, released in 1971, would follow with another violent project, The Wrath of God. But while Flight is funny, warm-hearted, and accessible to children and adults, it definitely does not sugarcoat the legitimately grim story at its center, thus making it thematically consistent with the Nelson projects that bookended it. And it also provides a rather direct address of the ongoing through-line of Wild’s characters in his ‘70s prime. 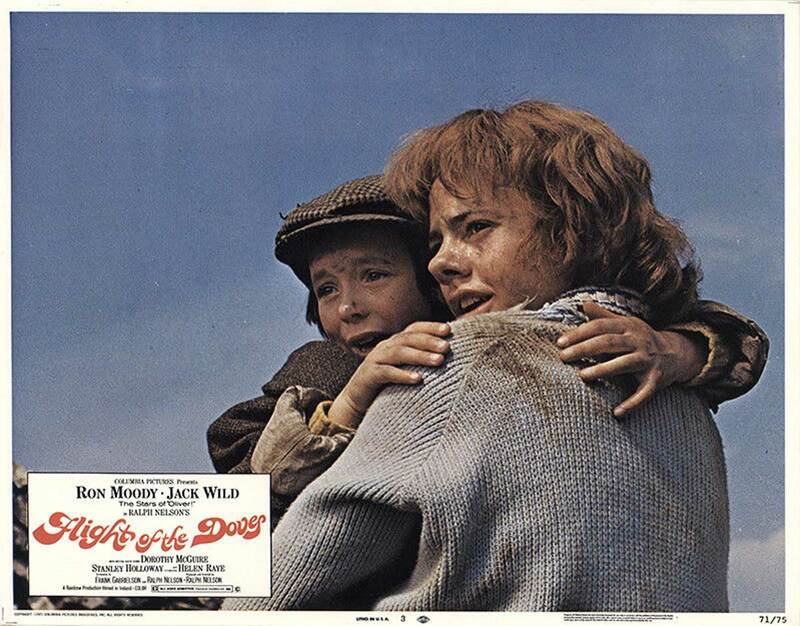 Flight depicts the odyssey of 13-year-old Finn Dove (Jack Wild) and his 8-year-old sister Derval (Helen Raye), who, when fed up with the abusive treatment by their English stepfather Tobias Cromwell (Willie Rushton), flee their Liverpool home and improvise a path to Galway, Ireland, hoping to find a home with their long-unseen grandmother Mary O’Flaherty (Dorothy McGuire), who has indeed long wanted them to live with her. The children are unaware that they are now beneficiaries of a large inheritance from Mary’s late husband, but their estranged uncle John Cyril “Hawk” Dove (Ron Moody), a failed stage actor known for violent behavior, has already found this out first, along with the fact that if they are determined lost or dead, he will be the next in line for the money. In a manner that predicts the dastardly tricks of Count Olaf from Lemony Snicket’s a Series of Unfortunate Events, Hawk uses multiple disguises to trick Cromwell, the Irish police, the news media, and others into leading him to the children. Finn does his best to keep Derval safe in an unfamiliar land, trying to suss out helpful strangers from opportunists…especially when any one of those people might be wicked Uncle Hawk. 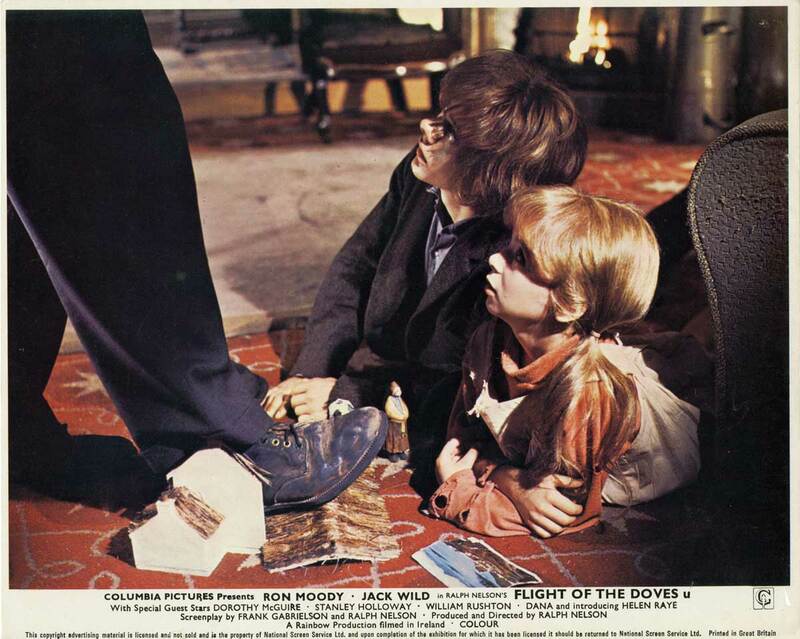 The reunion of Jack Wild with his Academy Award-nominated Oliver! 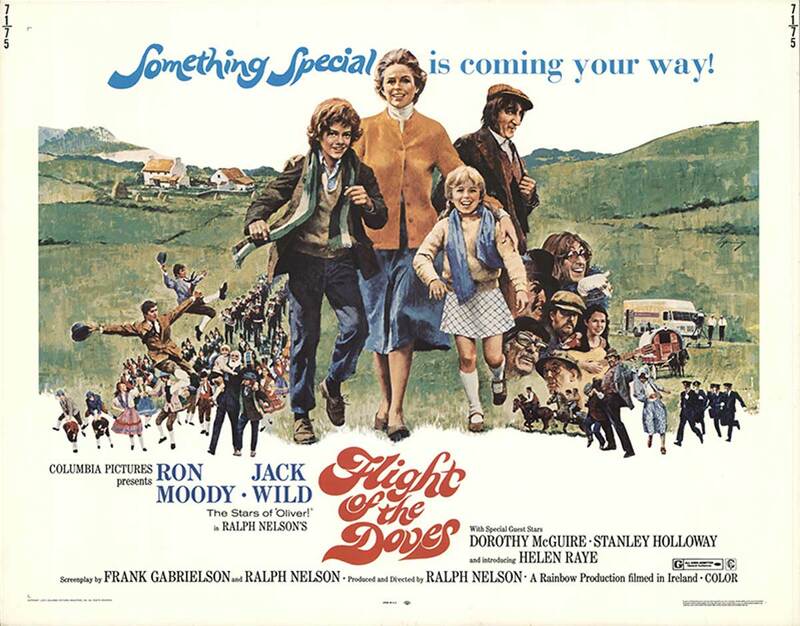 co-star Ron Moody in another adventure where Moody played a con artist and Wild a street-savvy adolescent, staged in a climate of ostensibly cheery Irish atmosphere, was surely what prompted Columbia Pictures, who produced the 1968 Best Picture Oscar winning musical, to back Flight of the Doves. 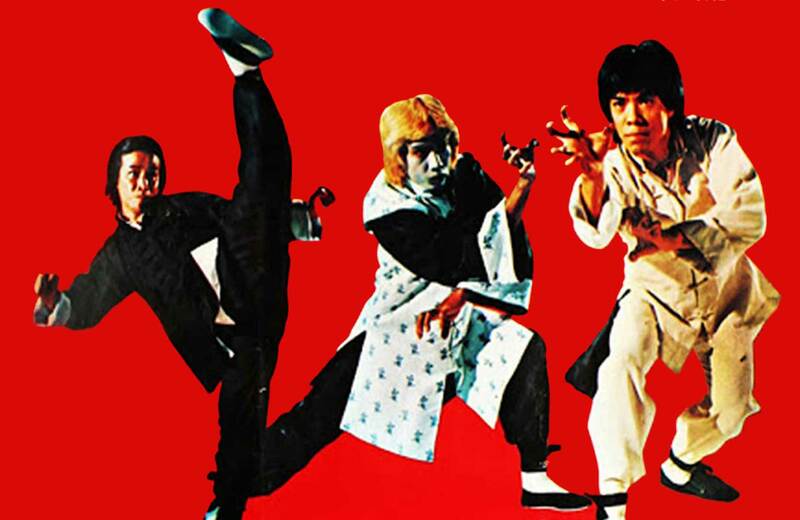 Moody, who would make one more project with Wild in 2005, was happy to rejoin his young friend, remarking on their collaborations, “We were more like Laurel and Hardy. We used to call ourselves Fagin and Dodger. We had that kind of bond between us.” It is likely that, to further lure Oliver! fans and families into the cinemas, Columbia prompted film composer Roy Budd, who had written an otherwise lush and touching score, to inject a large song and dance number into the story, “You Don’t Have to Be Irish to Be Irish,” to cement the connection; the composition was prominently featured in the 1971 5th Avenue St. Patrick’s Day parade in New York City, fortuitously promoting the film’s impending April release. However, the studio was probably not prepared for how Nelson injected a significant amount of sociopolitical grit in turn. (It may be an explanation for why the film is one of the few Columbia Pictures releases that, while opening with the famous Torch Lady, does not present the studio name or byline with her.) The opening sequence, where Finn presents a lovely model of their granny’s home to Derval, only to have Cromwell stomp on it, demand she put it in the fireplace, and raise his hand to her when she defies him, signals up front that the stakes the children deal with are real. The ongoing hostilities between Britain and Ireland, which had not yet boiled over into what would become the Bloody Sunday incident, are played for rueful laughs, not the least of which is the hated stepfather’s name: as Hawk observes during a press conference, “The first Cromwell slaughtered the Irish. This one’ll talk ‘em to death.” Hawk, in his various disguises, gleefully mocks archetypical Britons like oh-so-proper solicitors, gruff police sergeants straight out of a “The Sweeney” episode, and posh dilettantes, further indicating his disdain for Brits. A recurring gag where little Derval is bewildered by seeing Gaelic and Hebrew writing suggests how living under their stepfather and the English monoculture he represents has left her unaware of the larger world and what it has to offer. And even the otherwise Faith-and-Begorrah-laden “You Don’t Have to Be Irish…” number veers into bolder territory as Jewish, African, East Asian, and other non-white-and-Catholic marchers assert their claim and love for the country, a rebuke to the open anti-immigrant racism in England that yielded “No Blacks, No Irish, No Dogs” signage, Enoch Powell’s “Rivers of Blood” speech, and the National Front, telling the world multiculturalism was encouraged on the Emerald Isles, though, as testimony given years ago to the Irish government-appointed Mother and Baby Homes Commission of Investigation would indicate, this concept was probably itself more aspirational than realistic. If it seems that Jack Wild was always playing boys prematurely dealing with adult burdens, in a sense, it’s because he did so in real life. Born to blue collar parents, Jack and his brother Arthur had been playmates of future rock legend Phil Collins, whose mother June ran a performing arts school, and had encouraged Jack to study under her. But in order to afford to attend her school, Jack paid his own way through all the stage and television roles he got. As quoted by The Independent, “My parents were working-class and couldn’t afford [the tuition]. At 12, I was treated as an adult at ‘work’ and it was difficult for me to switch from that role at home. I grew up too quickly.” Thus, as onscreen he would be feeling the responsibility of, say, protecting the occupants of Living Island from Witchiepoo on “H.R. Pufnstuf,” he felt just as responsible to provide his loved ones with whatever they wanted. “I spent most of the money on the family, buying them cars and houses.” And since he’d already picked up adult obligations, he picked up adult vices as well. “I was smoking since I was 12. The people around me – the agents, personal and business managers – could hardly say, ‘You can’t have a drink.’ I was employing them, after all.” He had once determined that he had been drinking on nearly every shooting day of Flight. Indeed, time and again, whether it was playing big brother here in Flight, or confidante to Mark Lester in Oliver! and Melody, or guardian of Freddie the Flute in Pufnstuf, or apprentice to an alchemist in The Pied Piper, or unexpected man-of-the-house in The 14, Wild became synonymous with being the boy stepping up to love and protect others. And most often, he did so with little reward for himself: he reunites with Fagin in petty crime, he never got off Living Island, he sends off his best friend in “marriage” in Melody, and he is the frail boy left behind by The Piper. Flight offers one of the rare occasions where for once, the happy ending is as much his to enjoy as it is for his treasured charge. And in his off-screen life, with long stretches spent in addiction and out of work, his instinct to look out for others remained present. Alex Jay told the BBC, “Even in his drinking days, he was always very careful about being photographed with a drink or cigarette in his hand because he didn’t want to encourage young people.” Wild famously wrote an open letter to Daniel Radcliffe upon his casting in the Harry Potter film series, offering cautionary experience from his own life and upbeat encouragement to the young star-to-be on how to properly use his moment in the spotlight. “He always looked at the positive side of things. He always looked at the sunny side, despite all the things that he had been through. There was always a next day. He always got on with it. He wasn’t one to sit back,” said Jay. Over the years, people have tried to blame my battles on my early success as a child actor, but I just don’t see that. I’d have been an alcoholic no matter what career I had chosen and, rather than my success unbalancing me, I think it balanced me out. Without it, I would have been capable of anything, even murder. Some of my family ended up on the wrong side of the law, and I think I would have been there too if it hadn’t been for my success; my success did not destroy me, it saved me. And, as that corny production number might say, that’s the kind of luck you don’t have to be Irish to receive or deserve.